It can be pretty scary for a bird owner when your bird escapes his cage. If you accidentally left the cage door unlatched or your parakeet managed to fly free while you were trying to freshen up his home, you could be in for an interesting day. You can recapture your parakeet, as long as you approach the situation with a level head and a focus on the bird’s safety and well-being. Seal the bird in your home by closing windows and doors. If possible, isolate the bird in a specific room of the house. Place the bird’s cage in the same room as the bird. Open the door to the cage and drop some fresh food inside. Parakeets will often return to their cages for a drink or snack, giving you a chance to close the cage door. Toss a light towel or sheet over the bird. Gently pick up the bundled bird and take him over to the cage, releasing him through the door. This is a good option if your parakeet is particularly stubborn about returning to his cage.  If your parakeet escapes outside, placing his cage near the exit he used is sometimes all it takes to encourage him to return. Parakeets don’t usually roam far and will come back when hungry. 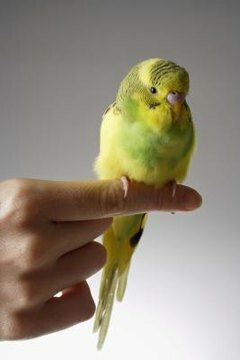  Handling your parakeet on a regular basis will make him more receptive to your touch, which can make it easier to approach him when he's out of his cage. ⚠ Always treat your parakeet with care; they are delicate animals.